Every American family has its own Thanksgiving traditions, and for whisky lovers they no doubt involve a few glasses of their favourite drink. So how do the most devout of whisky fans mark the holidays? Jake Emen asked America’s biggest whiskey-making families how Bourbon plays a part in their Thanksgiving traditions. Thanksgiving is a special time across the United States, with family travelling far and wide to come together and share the American holiday. Sure, turkey and sweet potatoes and cranberry sauce are all essential elements of the get-together, but nothing matches the warm glow provided by a few drams of whisky. At my family’s gatherings, you’ll find football on the television and drinks flowing by noon, the festivities getting under way with a light brunch cocktail or a glass of Beaujolais. Snacks and alcohol are both available on demand from this point forward, so it’s essential to pace yourself appropriately. As the major mid-afternoon meal gets served, it’s likely that our palates stay focused on red wine. After dinner then is when it’s time for a good dram, to put the stomach and the soul at ease. And on this holiday, we usually select one of the gems from my father’s stash – opting perhaps for a show-stopping sample of The Balvenie 30, a pour of Pappy Van Winkle, or a taste from a bottle I’ve brought back from my travels, whether Hibiki 12-year-old from Japan or a Kavalan distillery exclusive from Taiwan. These days my family lives in sunny Scottsdale, Arizona, so whisky is no longer a necessity to warm the bones or serve as a crucial fireside companion, as it was during the holidays when we all lived on the east coast of the US. 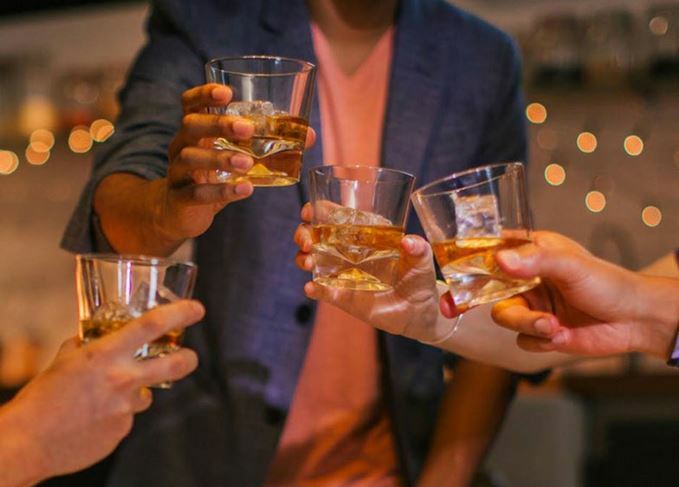 Even if shorts and flip flops are seasonally appropriate during the day, the desert temperature rapidly drops at dusk, and regardless, nothing goes better than a great dram while catching up and spending time with the people you hold dearest. It’s not only whiskey lovers who come together over turkey and Bourbon during the holidays. We asked representatives from Bourbon’s biggest whiskey-making families to share how they take part in spirituous familial traditions on turkey day. ‘Not only do we have the Brown family heritage, but my mother’s family are Caseys – Irish – so whisky and a nice drink have always played a role in our Thanksgiving and other holidays through the years. I am not sure I can pinpoint one thing in particular – we don’t do a special Bourbon-infused gravy or anything – but you tend to see drinks poured from one of our old holiday decanters. Old Forester was the first brand to issue holiday decanters through the 1950s, ‘60s and early ‘70s. They’re hard to come by these days, but they’ll definitely come out for family gatherings. ‘There is a great Old Forester toast that was featured about 100 years ago that is recited often, most memorably by my dad’s younger sister, Dace: “Many, many times a day, discriminating doctors say: ‘Old Forester will life prolong, and render old age hale and strong.’” Obviously, not a piece of copy that we could run today but I love that it exists and I smile every time someone reminds us we need to say it! ‘I think with most families in Lynchburg, Jack Daniel’s is so connected into our everyday lives it becomes as much a part of the home as keeping sugar and flour in the pantry. This is what makes our product so special – our hometown of a few hundred people. Many are multi-generation whiskey makers, and share a pride of making this great whiskey that is enjoyed by other families all over the world. ‘We typically have a cocktail before dinner. For some reason it has been a before-dinner ritual and not after dinner, and we’ve always referred to it as a ‘toddy.’ I think my grandfather may have started this signature call. The recipe is pretty simple: three cubes of ice and a good pour of Jack Daniel’s Single Barrel or Old No. 7. That’s it. I’ve never seen anyone in my family put anything into a cocktail other than ice or maybe a splash of water. ‘Whisky has been a part of my family’s life no matter the time of year. We always enjoy coming together at Jim Beam’s original dining room table and having a glass of any Bourbon or whisky. ‘One whisky cocktail recipe that my family makes no matter that holiday, is my mom’s Whisky Sour that she made with frozen lemonade, orange Juice and Jim Beam Bourbon. Her whisky sour is one we make all year round. Use our flavour-by-flavour guide to help Scotch find a place at the Thanksgiving table. Jack Daniel’s assistant master distiller on toasts, charcoal mellowing, and MacGyver. How are Bourbon and grain whisky different? Both are made from grain and distilled in columns, yet the two whisky styles are vastly different.